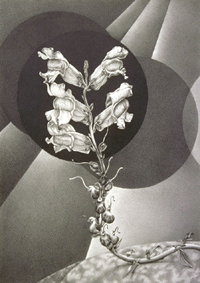 Steve Scheibe's graphite drawings from 1991 investigate plant tropism as metaphor for human experience. Plants' pattern of growth toward the light or upward against gravity…and root growth with gravity…is called tropism. The artist writes, "Tropism can be a metaphor for what I’m attracted into or repelled from in relationships, motivation, inspiration etc. It embodies my growing and reaching and grasping - my appetites, my longings - beyond merely eating and breathing."